When the Maryland Terrapins took the field against ACC rival Miami, fans were treated with the new core-stabilizing technology Under Armour “Pride” uniforms. The yellow, black, red and white helmets, modeled after the state flag, became the talk of the town as Maryland’s aerial attack lit up the short-handed Hurricanes with Maryland defeating Miami in a thrilling and wild game, 32-24. The helmet/jersey combo is one of 36 designed to make players faster, lighter, and “ready for battle.” Under Armour kept the uniforms under lock and key—so much so that players did not even know what they would be wearing until kick-off. The team actually warmed up in its “Fear the Turtle” look, but when returning back to the field prior to kick-off, sported the new “Pride” uniforms. @LebronJames: OH GOSH! 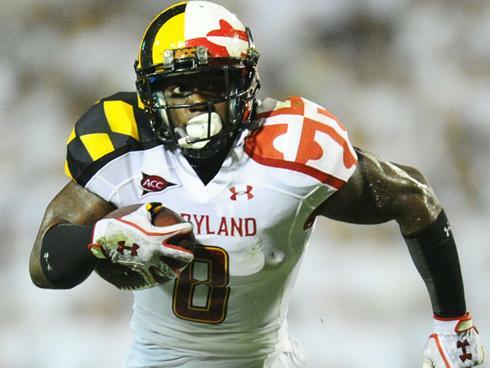 Maryland uniforms #Ewwwwww! @ErinAndrews: Oh my!!! Maryland unis!! Despite what fans think of Maryland and Under Armour’s new uniforms, Maryland’s ACC 2010 Rookie of the Year Danny O’Brien torched Miami’s secondary, amassing 348 passing yards and one TD in a rainy and muggy Byrd Stadium. Now that Maryland made a fashion statement and threw down the gauntlet, it will be interesting to see if a school such as Oregon will accept the unofficial challenge and show who in the college football world can design the worst possible uniforms.